Optimizely co-founder and CEO Dan Siroker shared some big numbers today about the A/B testing service’s growth. Let’s go with the biggest one first. Siroker says Optimizely, which makes it easy for websites to conduct tests to optimize their design and content, has now delivered those tests to 1,303,364,329 visitors around the Web. (He provided the number this afternoon, so those last few digits are probably too low now.) He also says Optimizely has run a total of 100,000 tests. Or, if you want a more concrete point of comparison, let’s look at something Siroker said back in May, when Optimizely raised funding. At the time, he boasted about passing Google Website Optimizer in adoption, and he said he was aiming to surpass the market leader, Omniture’s Test and Target product. Now, he tells me (and announced via blog post) that Optimizely has achieved that goal. 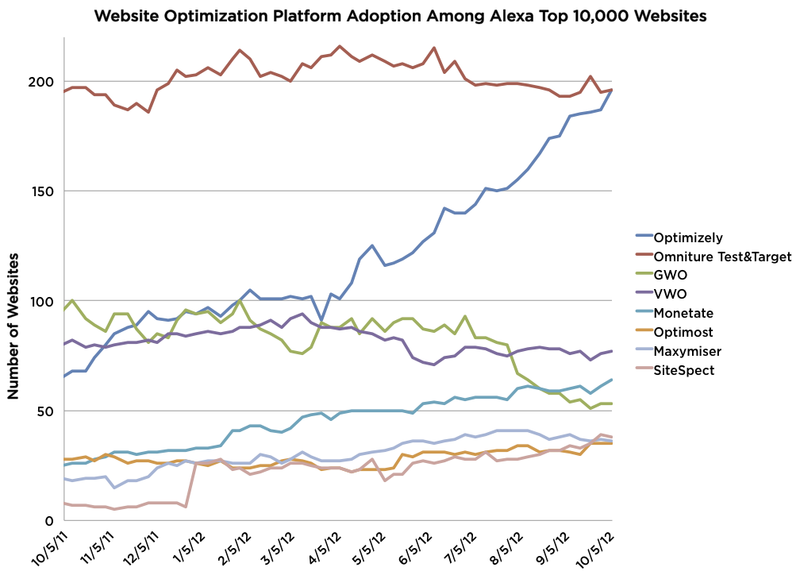 Specifically, BuiltWith reports that Optimizely is being used by 1.96 percent of the Alexa top 10,000 sites, putting it on par with Omniture — and given the way Optimizely is growing, it seems like a pretty clear bet to secure the lead (though there are other BuiltWith stats, like usage by the total number of sites, where Omniture still wins). Optimizely now has more than 2,800 customers, including GoDaddy, Footlocker, Electronic Arts, CareerBuilder, Gilt, New York Magazine, LexusNexus, Art of Shaving, and The New Republic, Siroker says. Perhaps most interesting is the fact that established media organizations, like New York Magazine and The New Republic (recently acquired by Facebook co-founder Chris Hughes), are getting onboard. In the past few months, Optimizely also launched its mobile product. Siroker says the next step is to go beyond A/B testing, with “really sophisticated segmentation and personalization tools” in the works. The goal is to help publishers deliver a unique experience for each user in the same way that Amazon and Netflix do now.